This is my Easter cake recipe. I can actually eat this cake without fear of being crippled with stomach cramps for days afterwards. The recipe is adapted from a book my mum bought for me called The Guilt-Free Gourmet by Jordan & Jessica Bourke. 1. Preheat the oven to 180C (350F), Gas 4. 2. In a bowl, mix together the ground almonds, xylitol/sugar, baking powder, chia seeds and matcha powder with a wooden spoon. 3. In another bowl, whisk together the eggs, sunflower oil, the 2 teaspoons of agave syrup, and the orange and lemon zests. 4. Pour the wet mixture into the dry mixture and combine together using an electric whisk. 5. Pour the cake mixture into the baking tin(s) and bake in the preheated oven for 35-45 minutes (35 minutes was enough when using two tins, I suspect using one tin will take a bit longer). Insert a skewer into the top and the end of cooking time, and if it comes out clean, your cake is done. During cooking, if the top looks like it is going to burn, cover with foil, but be careful not to press on the cake. Personally, I like it a tiny bit browned on the top anyway. 6. Allow the cake to cool slightly while you make the syrup. 7. Put the orange and lemon juices, the 60ml/5 tbsp, the cloves and the cinnamon into a saucepan. 8. Bring to the boil and reduce the heat. Simmer for 5 minutes. 9. Strain the liquid through a sieve, making sure you remove the cloves and the cinnamon sticks (you can set these aside). 10. When the cake is still warm, turn it out onto a plate, drizzle the syrup over and allow it to seep in. If you’ve made two smaller cake, use some of the syrup on one half of the cake to sandwich the two cakes together. Drizzle the rest of the syrup over the top of the cake. If the syrup is not absorbed all at once, you can always set it aside and drizzle some more on later, or you can do what I did today and make a little slit in the top of the cake and pour the rest of the syrup into the hole. 11. When you are ready to serve, pile the cinnamon sticks and cloves on top of the cake for decoration (I didn’t do this because I was too excited about eating it). 12. The book suggests to serve the cake with some soy yoghurt with a bit of ground cinnamon stirred through it. Personally I don’t think it really needs it as this is a very moist cake. If anything, the yoghurt will probably tone down the sweetness a bit. You need to eat this cake with a fork, otherwise it will fall apart in your hands and you’ll end up with very sticky fingers. It’s very naughty on account of the sugar and the oil… but hey, I’m not having Easter eggs! Enjoy! Hope you are having a happy, healthy (within reason!) Easter. 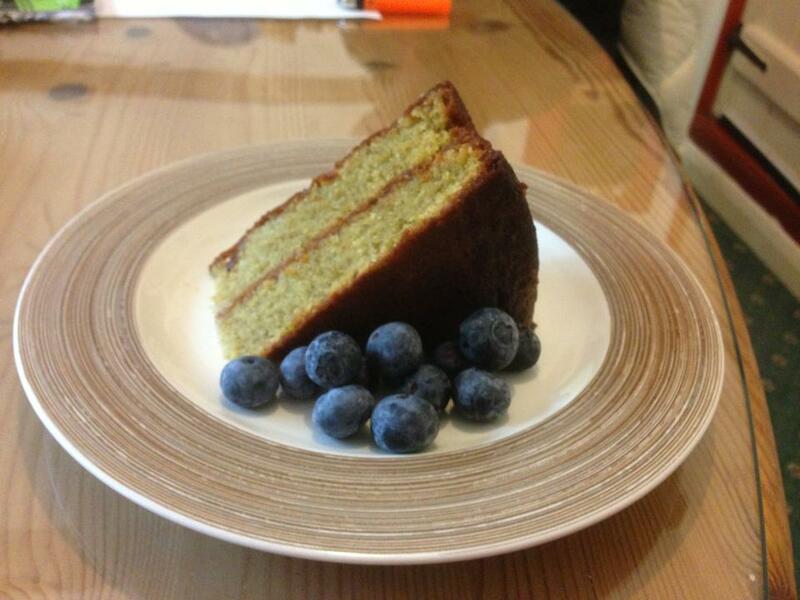 Categories: Recipes | Tags: cake, gluten-free, lactose-free, naughty | Permalink. RYT-200 Vinyasa Flow Yoga Teacher. Fluent French and Spanish speaker. I also play a bass clarinet. I own a classic Jag. I love my husband and our 3 cats.